Can you please throw a clear light on the topic "Trinity". Muslims also believe in Jesus, not as God, but as a prophet. We can see, in many cases, Jesus is pleading to the Father for doing miracles. Why can't he do it alone? Being a god, is there any need for Jesus to pray to the Father? We can also see in Bible, Jesus saying; "Your God and My God....Father is greater than I" etc. Also in Acts 3:26, Jesus is referred to as "Servant" of God. It can be interpreted as "Jesus is just a man like any other prophet. He doesn't have any Godly power or divinity. The Father is the only God, whom Jesus also prays to". Kindly help us to understand existance of Father, Son and Holy Spirit together as one God. Trinity is primarily a mystery which is beyond any human description and exhaustive comprehension. The Church experienced God at three stages in history in three ways. At the same time it knew that God is one. Trinity gave a perfect means through which the Church was able to explain its experience. The fathers of the Church tried to explain Trinity several ways. One of the explanations I found better for my understanding is; the Father is the thought, the Son is the Word that is the expressed thought that contains full essence of the thought and the H. Spirit is the dynamic of the thought through the Word which carry the same essence. So the source of the other two are the thought (the Father), and medium of the dynamic is the Word. The Word put to work by H. Spirit. We do not see the thought. We hear the Word and see the H. Spirit when some thing is done by the Word. In the fullness of time in the Incarnate Word we were able to both hear and see the Word in Jesus Christ. We are not able to see the H. Spirit today. But we see its working today in the Church and its members. I am not sure whether I made myself clear. It is in fact a mystery and therefore beyond any explanation. Hope the day of the Lord bought new joy and peace in your busy schedule. caling; One Lord, One Faith, One Baptism." creed we too affirm that there is Only One Baptism. It may be question of Heresey, but do waiting for your humbe reply. We do not accept the baptism of Pentecostal communities because it is not meet the requirements of a valid sacrament. Any one can dip a human in water and say you are baptized. But for us it will not make a person baptized. Any act of mystery or Sacrament through human has to have certain criteria kept. A holy time (or a set apart time), a holy person (validly ordained person, say a clergyman), a holy place (around a community that is specifically called together) a holy word (words of institution) and holy act (specified way of doing things). Only in such situation H. Spirit will be active. It is the Holy Spirit that perfects an act of human. We do not accept the validity of the ordination of the pastor that performs the baptism. Therefore this person can not create a holy place, a holy time, utter a holy word and perform a holy act. One of my close relatives, rarely participate in the Holy Qurbana and comments on those who participate regularly. He wondered how they could do it since the prayer says 'Ee sudhathakal vishudhiyum vedippum ullavarkku maathram nalkappedunnu'. He also said that we are told that of we participate when we are not pure it causes our death. I had heard once that the lines following the above, which says that the Trinitarian God is the only one who is Holy and that He is with us is the answer to this paradox. I also thought that perhaps that is why the unbaptised about whom we are unsure, are not allowed to participate. Anyway I said that it is not about our personal holiness as we cannot be holy. The answers given by Fr T George and Mr Koshy on ICON does not answer the question. In Saadhakante Sancharam it says we can approach as a sinful but repentant son would approach the Father. I guess we should also be determined not to repeat the old sins. I also heard some people say that usually when they participate some kind of quarrel takes place afterwards. I sometimes have the same experience because I come home dead tired after fasting and gets very irritated as I want to lie down but have to prepare Sunday breakfast and lunch etc. I am diabetic and my routine medicine etc are totally upset and it takes a couple of days to recover from the effects of hypoglycemia and acidity.. Now I do not participate in the bread & wine on Sundays, but go on Wednesdays when the service is short and I can get home to breakfast by 8.30. Can a sick person have medicine and food (some vegetarian food or milk) and go for Qurbana? We were told in Bangalore we must put a gap of 5 hours between eating and qurbana. Then if the service starts at 6.30, but the QUrbana is given at 8.30-8.45, can we eat around 3.30? . But that would not help with taking medicines as I have to take it at the same time each day. What is the solution? A working person staying at some distance from the Church may not be able to attend the Wednesday/Saturday Services. First of all there was nothing irregular or improper in your queries. God, for that matter Jesus Christ, never intended to make things difficult for humans to be saved. Some times we, out of our ignorance or simplicity or over enthusiasm make it too hard to be in fellowship with God and fellow beings. The answer to the first question is, yes the priest would say the “these holies are given to the holy and pure”. But following this the priest says, The Holy Father who created the world is with us, one Holy Son who redeemed us through the suffering is with us and one Holy Spirit that perfects every thing is with us. The people would respond and say Amen. In the fellowship of the Holy Trinity which is holy in itself we become eligible to receive the Holy Eucharist. As you may see in the blog, the Church fathers would say that the H. Qurbana is celebrated for those who participate in it. When ever you attend a service you are supposed to receive the H. Eucharist. As for Orthodox understanding any baptized person has the right to demand H. Eucharist any time day or night without any questions asked or objection raised. It is the right of the believed and the duty of the priest to administer. It is for the forgiveness of sins and for fellowship with our Lord. It is given to those who do sin that they be empowered to resist satanic forces and not to sin any more. Yes we should try not to repeat the old sin. But we are humans and may repeat. That will not deny our right to H. Qurbana, rather help us to continue the struggle to get out of the clutches of sin and Satan step by step. Holy Qurbana is a fellowship meal of the family members with the head of the family who is Christ Jesus. The membership in the family is guaranteed through baptism. It initiates one in to the fellowship of Christ. That is why we do not give H. Qurbana to the un-baptized. I do not know why people should quarrel after the H. Qurbana. This may mean that they have not internalized their participation with Christ which is in fact participation with fellow beings. This should start with the family members. They should understand each other, respect and participate in the toil of fellow family members. If that happens there will not be any quarrel. Receiving H. Qurbana will not have any magical effect on us. It will transform us. If it does not, then it means we are not taking it seriously and are not participating consciously and effectively. That is our fault and not the fault of the H. Qurbana or its consumption on a regular basis. Regarding your second question, The Church certainly makes exceptions to its rules under specific situations. A sick person, a person on the road, a pregnant woman, infants all are exempt from common laws of receiving H. Communion. H.G. Mathews Mar Barnabas Thirumeni has been a sick person for quite a long time. He is acute diabetic. He used to get up at 5 in the morning say the mid-night prayers, take his breakfast, then take a short nap of an hour or so and then go for H. Qurbana. This is perfectly all right for people with acute health concerns. Again probably there should be some consideration on the part of your family members too. After the Sunday service you can have a pre-cooked meal or some thing light like fruits or bread and butter for the whole family. That will make it easier for every one in the family. When you are angry others will also be angry. we justify our act of veneration of the holy Cross on the Good Friday service? wrapping the holy Cross for the entombing service on good friday? Seeking the blessing of your grace, I remain. Regarding your first question, being a student of Old Testament, I do not wish to comment on the passage you quoted. This is because it might require extensive introductory explanation to talk about what really was happening there historically. Regarding the question about the cross, it was long been answered by several Church fathers and scholars of the community (I am attaching a copy of an article from H.G. 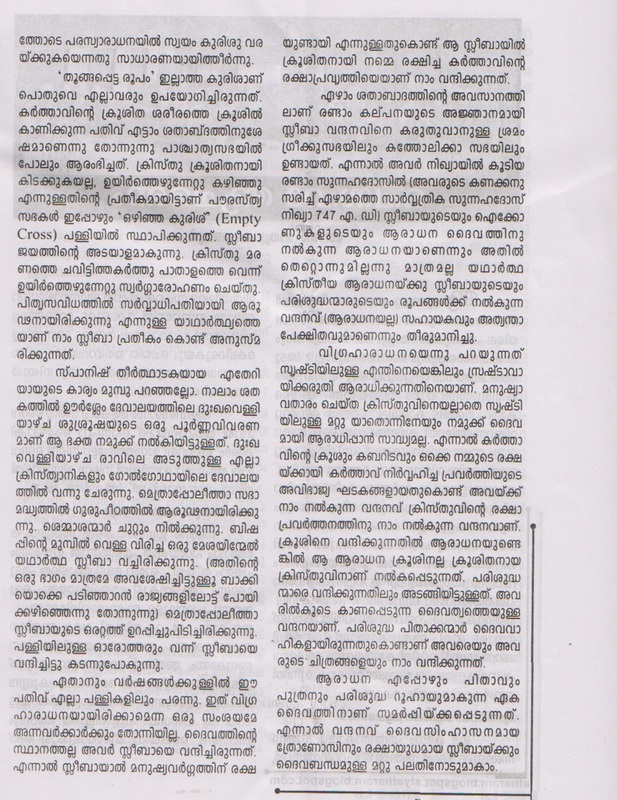 Dr. Paulose Mar Gregorios on this). There is a historical context where cross became a symbol of Christianity that considered it as a symbol of salvation. Earlier, as you may know, Christians used FISH as their symbol. This was replaced by cross after the Constantine era. In the course of history several meanings were attributed on to it. In simple terms it is the symbol of the salvation Christ brought to this world through his death and resurrection. First of all, the cross itself went through a transformation. It was a symbol of death and destruction. With death on the cross and resurrection of Christ it became a symbol of life. So for anyone who honors the cross, this became a symbol of their own transformation. You can transform another only if you first transform yourself. Again cross became the symbol of vicarious suffering. The humiliation Jesus experienced by being crucified was not on his accord, rather on behalf of others. This is some thing to be valued high. Cross again became a synonym of salvation. It was the cross or the suffering on the cross Jesus took on himself that took away the suffering and punishment humans had to take because of the fallen state they had due to the sin of Adam. So cross on several accounts became a symbol of Christian existence. The very self of Christianity is expressed in the cross. This has to be esteemed high and respected without limit. However, it is not the cross that brought salvation rather it was Christ who died on the cross who did. But people need symbols for them to effectively and concretely do things. So Christians chose cross as a meaningful symbol that can take the respect of people on behalf of Christ. Cross is never considered an idol because we do not believe that it saved us. When we venerate cross, if anyone thinks that it is the cross that saved us and therefore we are venerating it, it has to be condemned. On the part of the Israelites those idols and even the bronze serpent became gods and objects of worship considering them as source of blessing. Of course there are Hollywood movies that tell you that cross will drive away demons and evil spirits. Well, it will not. In popular religion too people may think of the cross this way. Nevertheless, a person can gather courage by wearing a cross to drive away evil spirits not in a magical way, but with a psychological effect. Every one needs some thing visible and concrete to hold on to. Religion provides symbols and tools to do that. It is the responsibility of the religion to at the same time tell the people ‘it shall not be made a god rather go further to reach to the ultimate transcending the symbol’. The Syriac Pshito of Gospel according to St. Luke 23:52-53a would read, (52) “hono khreb luoth Philatos vusael pagre d’yesu (53) va’hetheh vkharkhe bhyozo dkhetono vusomeh bbeth kabro nakhiro …”. Here the word used for the cloth that covered Jesus body is “khetono” that can be translated as cotton. This is reflected in the liturgy and readings for the day also in our Syriac tradition. However, the Oxford dictionary of Syriac-English by Pane-Smith translates the word khetono as linen. Greek word used here is “sindowni”. This is also translated by Greek- English Lexicons as linen. Nevertheless, Greek-English Lexicon edited by Johannes P. Louw and others of the United Bible Societies correctly says that in many ancient languages there was no word for linen. The lexicon also says that though the word is usually translated as linen, it may simply mean fine cloth or expensive cloth or just good cloth. So we may assume that the translation linen does not talk about the material rather of the quality of the cloth. Whether you translate it as linen or cotton it simply does not matter as long as it implies that it is a very expensive cloth. In modern spoken Syriac “khethono” is cotton (see similarity in pronounciation). We are well justified in translating the word as cotton. Once again, thank you for answering all these questions, and thanks for finding the time for it. Your answers are all highly enlightening, and at times much thought provoking. Your answers regarding the essence of the Holy Trinity and receiving the Holy Eucharist are all well understandable. 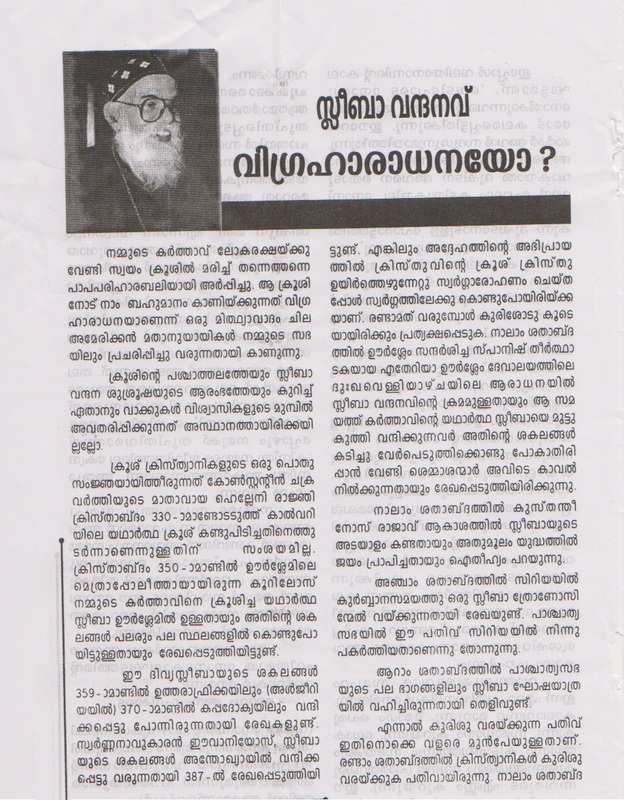 Your answer concerning the "Adoration of the Holy Cross", together with the article by the LL Paulose Mor Gregorios Thirumeni is very educational and very timely because of the upcoming Passion Week. We wish you good health, long life, and all the rest of the very best. Thank you John Daniel. I am glad my postings make sense. Hope you and your family are doing fine by the grace of God. Happy Easter. Hope you are fine by His grace. While reading Holy Bible, I find contradictions and that confuse me a lot. I'm in KSA and here is no body to clear the doubts. 1. We believe that the robber crucified on the right hand of Jesus was saved by his faith in Jesus. In St. Luke's gospel, the side is not mentioned. How can we say that he was on the right and his name was Titus? More over in St.Mathew's gospel we read both of them insult Jesus. 2. In St. Mathew's gospel, Jesus asks his disciples to bring donkey and it' colt. But in other gospels we see only one donkey. 3. This question is for my friend who belongs to Hindu community. At the birth time of Jesus 3 wise men come to see him by seing his star. He says this proves the validity of 'jyothisham & jathakom'. Is there any fact? With love and prayers - Saju. I'm a catholic gal !!! I needa marry a csi guy !!! Wat am I suppose to do ??? I needa marry in my church !! But he doesn't wish to convert ????? ?